Andy Goldberg is back! Last heard from (with the exception of a track on Kool Kat's Christmas album in 2010) as The Goldbergs with 2008's Under the Radar, the Long Island purveyor of hooks (lines and sinkers as well) resurfaces with a new band name but the same top-notch power pop. Hearing the opener "If it Wasn't for You" will be putting on an old pair of slippers as Goldberg makes the melodies sound easy, and if this were 1975 "Radio Song" would actually be on the radio. Meanwhile, the piano-based "Every Now & Then" conjures memories of Badfinger and "A Little Love Tonight" closes the album on a real high with perhaps his catchiest number to date. 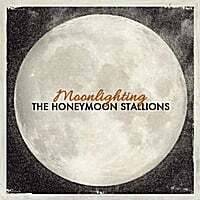 There are a few stylistic detours here which mostly work as well - "Gonna Fall in Love" is bluesy power pop, "By the Moon.." is almost a torch song, and "Driftin'" is janglier than normal for Goldberg. Add it all up, and you have a triumphant return for one of the top power poppers of the last 6-7 years. Hey everyone! For those who don't download, Kool Kat's got an on-demand CDR (with full art) available! New EPs from old friends.